In an invention published by the U.S. Patent and Trademark Office on Thursday, Apple outlines a process of identifying individuals in a digital image using facial recognition techniques and sending a copy of the photo out to those people by associating contact information pulled from an app like Contacts. 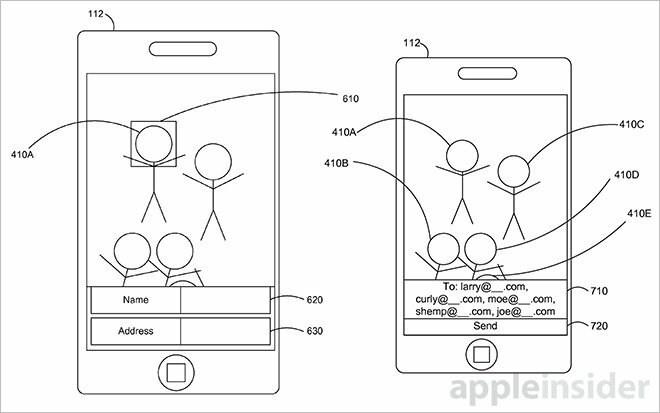 Titled "Systems and methods for sending digital images," Apple's first patent application describes a system that helps streamline the process of sharing photos with groups of people. Specifically, a service applies facial recognition algorithms to a digital image and presents options to share it with recognized individuals via email, SMS or other form of communication. For example, the system is able to recognize faces in a group photo and automatically propagate a list of potential recipients based on that information. Contact information like email addresses or phone numbers are pulled from an app like Contacts and assigned to the identified faces. Alternatively, users can associate address information to identified faces manually. In some embodiments, recognized faces are enclosed in a box or otherwise highlighted and presented alongside icons indicating possible forms of communication. Users can interact with the UI to select who in the photo will receive a digital copy and how that copy is sent. In some cases, a person may be assigned a default mode of communication, such as SMS or email. In another example, users can automatically receive photos in which they are identified on an opt-in basis. This scenario entails uploading a picture to a cloud service for facial recognition and automatically sending out shared photo alerts to identified individuals. The picture's owner may apply restrictions to the sharing process, limiting access on a per-user basis or sending out share invites to other users not present in the photo. The application also covers facial recognition algorithms and concepts for learning new faces, a feature that can be used to retroactively tag individuals in photos. A live facial recognition database can be built out and synchronized with a mobile device, like an iPhone, which can apply that information to newly captured photos for immediate sharing. The document goes on to detail facial recognition technology, exemplary systems and alternative embodiments, including options to connect with social networks. Apple already uses facial recognition technology in Photos for Mac, which intelligently identifies individuals and sorts them into appropriate Faces albums. The next step would be linking Contacts information with those faces for quick and easy sharing. Apple's photo sharing based on facial recognition patent application was filed for in February 2013 and credits Richard H. Salvador and Steve G. Salvador as its inventors.